I must admit to you, Friends ... I feel a little sheepish. I was so consumed (and rightly so) with this last Wednesday, September 15th being the birthday of my better half -- the amazing, the awe-inspiring, the so-talent-your-head-could-spin, The Jenn Newman -- that I was remiss in reporting on the birthday of another Diva. 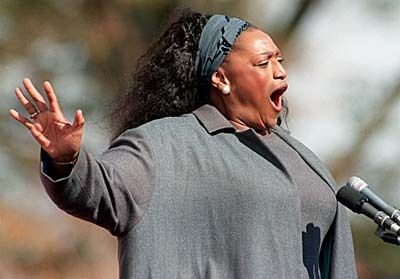 On Wednesday, Our Lady of Grand Buccal Cavities, Jessye Norman turned 65. That's right Ladies and Germs, the lady who's mouth seems to have been the original model of the flip-top-head, turned 65. What a better way to celebrate than to sit back and watch this Diva discuss her life and art. (You'll see what I mean about the flip-top-head. Make sure to turn up the sound though, it's a little muffled.) Enjoy!